Self driving cars – a few questions to ponder. Have you heard? Ontario is going to be the first province to test out self driving cars? Some people right now reading this is saying, “Yay!”, while some are quick to say, ‘uh oh..’. Both have good points to bring to the table. Regardless where your opinions stand on the subject, self driving cars are on their way. Many believe this will be the end of accidents in the traditional sense – which are mostly avoidable anyway. Many are fearful knowing very well that their industries are going to be massively disrupted. Some industries include but not limited to insurance companies, driving schools, taxis and public transportation, auto manufacturers and mechanics, as well as city planners. Self driving will soon be everywhere. 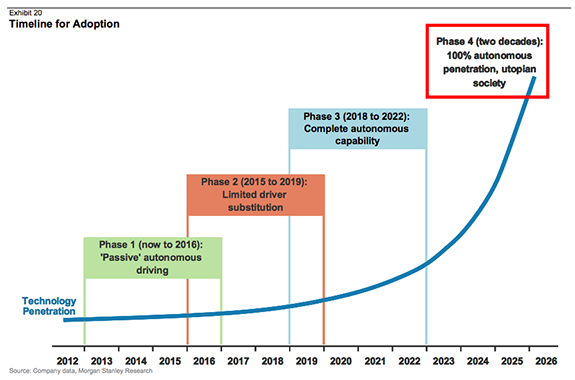 Google has clocked in over 1,000,000 miles of automated driving. 14 accidents to date, and never the self-driving car’s fault. There will be huge growth in ridesharing and self driving taxis (think Uber) as the price per self driving car drops. 2009 report states that in Canada, there is about 607 motor vehicles per 1,000 people. This will drastically fall as the cost of transportation using driverless public transportation and taxis increase. When less people own cars, how will this impact insurance companies? When cars drive themselves, what would driving schools teach? 1.2 million deaths a year are avoidable car accidents. Self driving cars will drop this number if not completely eradicate vehicle accidents. What impact will this make on human lives, families, and health care? Taxi companies in Toronto are complaining about Uber now, what political ramifications will be had when all taxi fleets, shipping fleets (think Fedex trucks, delivery vehicles, etc) when these jobs are gone? What will happen to auto manufacturers when people stop buying cars – or when this decreases by 50-90%? What will our cities look like when there’s 50-90% less cars on the road as everyone is using autonomous taxis and ride-sharing vehicles? Do some of these questions seem preposterous? So did the electric car a couple decades ago. So did landing on the moon a century ago. Things are moving fast. We have one of two options: Live in denial and be unprepared for what’s to come. Or embrace the beautiful future that’s inevitable. Bonus: Do you know of the trolley problem?